You're seeing a page from our old website - to see the new one, visit en.lbxco.com. Thanks! LBX Company LLC, Lexington, Kentucky has raised $48,500 in support of the American Heart Association’s annual “Life is Why We Give” campaign. 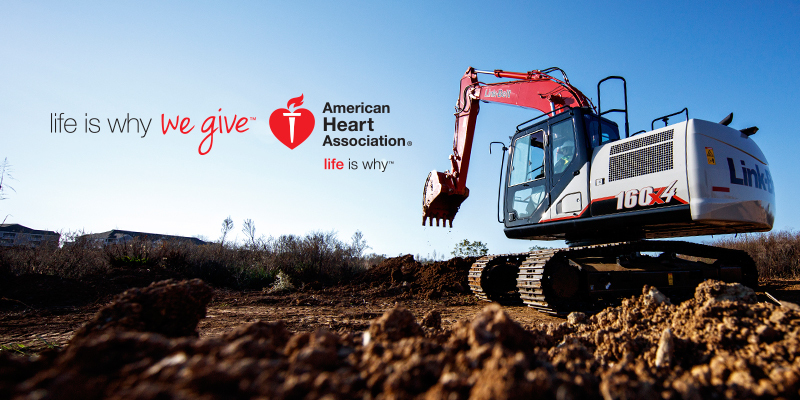 LBX made a commitment to donate funds for every Link-Belt excavator, forestry machine or material handler retailed in February in North America. A check will be presented to the Lexington chapter of the AHA on Monday, April 10th at LBX. For more information, contact: Lisa Bemis Events & Promotion Specialist, at lbemis@lbxco.com. LBX Company LLC is the proud maker of Link-Belt hydraulic excavators, scrap/material handlers, demolition equipment and forestry equipment. These products are sold through a large independent dealer network located throughout North and Latin America. LBX’s subsidiary company, LBX do Brasil, distributes these products in Brazil. LBX Company is a division of Sumitomo (S.H.I.) Construction Machinery, a world-wide leader in construction equipment innovation and quality manufacturing based in Chiba, Japan. More information is available by visiting lbxco.com or lbx.br.com. © 2019 LBX Company LLC. All Rights Reserved. LBX and Link-Belt are registered trademarks.